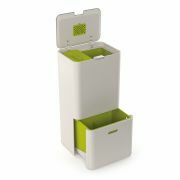 We all want to dispose of our waste in the best fashion possible and Brabantia and Joseph Joseph help us do just that. Joseph Joseph’s Intelligent Waste range are award-winning waste and recycling bins that let you keep all the elements of your recycling in separate compartments, making it easy when it’s time to put out the rubbish and recycling. 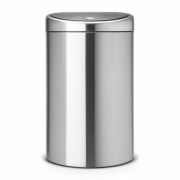 Brabantia too have an extensive range to choose from. Ironing boards, waste disposal trash bins and garbage bins too. This section will offer you touch close and pedal bins in cream, brilliant steel and matt steel. 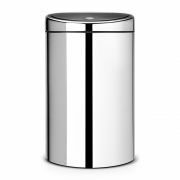 The products we offer here are of top quality from Brabantia and will be covered by the Brabantias 10 year guarantee. 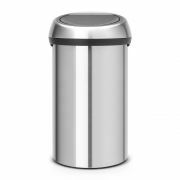 Brabantia bins feature a silent soft close system and they limit garbage smells when they are closed. For best results we recommend that you use the Brabantia waste bags and ironing board covers. These bags and covers are sized to match the bin or board and will fit snugly and neatly. 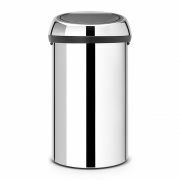 In addition with your Brabantia bins and bags when you remove the bin the handles will stay secure and intact for ease of handling. The sprig and leaf motif is available in cream on charcoal with an orange lid, and charcoal on cream with a yellow lid. Where would you put a Brabantia Orla Kiely Retro Bin and how it would enhance your home? A real splash of colour and quality. for living and giving that are also a pleasure to use and in turn being ethically friendly to the earth. As time moves on more and more we have to be aware of how much waste we have. Sorting recycling from rubbish, and composting from gardens cuts and trimmings. Thankfully our waste disposal items are helping to make all of these much, easier. Joseph Joseph’s Intelligent Waste range are award-winning waste and recycling bins that let you keep all the elements of your recycling in separate compartments, making it easy when it’s time to put out the rubbish and recycling. Whether its food waste, paper, glass, plastic or whatever you want to recycle there are plenty of handy drawers and compartments to keep it all separate. 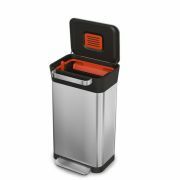 The highly flexible Totem bin has a recycling separation bin featuring a removable food caddy for all your food waste, a general waste compartment at the top which has a removable inner bucket and a multi-purpose drawer with a removable divider- so you can choose exactly how you want to separate your waste and recycling. 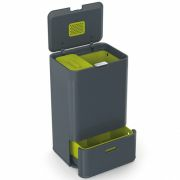 The versatile food caddy can be stored on the kitchen counter, in the general waste compartment or in the multi-purpose drawer. It also has a fingerprint proof stainless steel lid with odour filter and a powder-coated steel body.